[227 Pages Report] Specialty papers are special grades of paper which are possess of specific characteristics and properties designed for specific end use. The raw material used for specialty paper are pulp (from wood chips, recycled paper, wood pulp, and cotton fiber), which is fed into the paper-making machine; after that, the paper is coated with specialty chemicals for preparing it for a specific use. Specialty paper has emerged as a lucrative segment for the paper industry. From paper currency to coffee filters, décor papers, insulation paper, and carbonless copy paper, they are present in the daily lives of consumers. Europe dominated the market in 2014, which accounted for around ~33% in terms of volume of the total specialty paper market. On the other hand, Asia-Pacific is projected to be the fastest-growing market for the period considered for this study, due to growing demand for specialty products and increasing awareness among people. 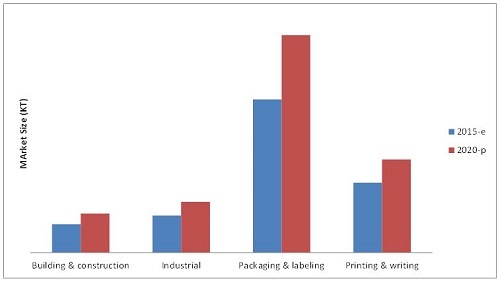 In terms of applications, packaging & labeling is projected to be the largest market for specialty paper from 2015 to 2020; however, the market is also projected to be the fastest-growing for the period under study. In North America, the U.S. accounted for the largest market share in terms of value and volume among all countries across the world. This report estimates the size of the specialty paper market in terms of volume (KT). In this report, the market has been segmented broadly on the basis of type, application, raw material, and region. The market drivers, restraints, opportunities, and challenges, and product price trends have been discussed in detail. The share of participants in the overall market has been discussed in detail. This research report categorizes the specialty paper market based on type, application, and region. Specilaty paper is one of the most important segment of paper and play a very significiant role for the industries such as packaging, printing, construction and labeling. Specialty paper is manufactured and sometimes, normal paper converted into special paper with use of chemicals. The specialty paper is in specific grades and is intended to use for special purpose. Specialty paper are gaining significance due to increasing end-use application and improving lifestyle and economy in countries such as India, China, Japan, Brazil, and Argentina. The specialty paper market, in terms of volume, is projected to reach 34,879.08 KT by 2020, growing at a CAGR of around 6.59% from 2015. The market was dominated by Europe in 2014, which accounted for around ~33% of the total specialty paper market in terms of volume. On the other hand, Asia-Pacific is projected to be the fastest-growing market for the period considered for this study, due to growing demand for specialty products and increasing awareness among people. 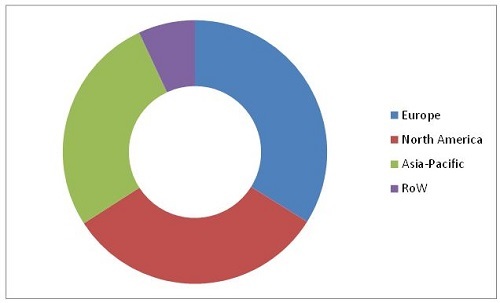 In terms of application, packaging & labeling is projected to be the largest market for specialty paper from 2015 to 2020; however, the market is also projected to grow at the highest CAGR for the period under study. Printing & writing are projected to grow at a CAGR of 5.89% for the period under review, owing to increasing consumers’ concern regarding lesser use of paper and paper made products the market is growing at a very low pace. In 2014,Printing & writing segment accounts for the second-largest share in the specialty paper market; the market tends to gain popularity in the next five years due to consumers’ increasing preference for laminated wooden sheets and wallpapers for residential as well as commercial interiors. The specialty paper market is characterized by intense competition due to the presence of a large number of both large- and small-scale firms. Expansions, investments, acquisitions, agreements, partnerships, joint ventures, and new product launches are the key strategies adopted by market players to ensure their growth in the market. The market is dominated by players such as International Paper (U.S.), ITC Ltd. (India), Stora Enso (Finland), Nippon Paper Group (Japan), Mondi Plc. (South Africa), and Sappi Ltd. (South Africa).